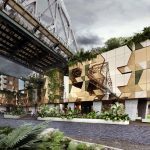 Art Series Hotels will open its eighth property, at Brisbane’s Howard Smith Wharves, next March. The hotel will be carved into the cliff under the Story Bridge and will feature 166 guest rooms, with custom contemporary furnishings and original artworks and giclée prints. Inspired by and dedicated to Australia’s contemporary artists, the six-storey hotel will also offer four distinct food and beverage outlets as well as a rooftop pool boasting views of the Brisbane River and CBD, bar, gym and three conference rooms. Howard Smith Wharves will be home to a brewery, green spaces and picnic areas, two indoor event spaces, overwater bar and waterfront restaurants. The lobby features a double-height wall of glass while the guest rooms enjoy city views across the Brisbane River or of cascading greenery and the sculptured rock face. Metro Hotel Perth … a new deal for cancer sufferers. In a new partnership with cancer support group Blue Dot Army and cancer treatment provider chemo@home, Metro Hotel Perth reckons it will be the first Australian hotel that enables cancer sufferers to receive in-room treatment, including chemotherapy and medical infusions. Blue Dot Army is a not-for-profit organisation dedicated to changing the way cancer treatment is delivered, focusing on the person, not the disease. The ‘blue dot’ represents the small tattoo a person with cancer must have to accurately guide the radiologist to administer radiation treatment, while ‘army’ represents the advocates, partners and volunteers who support people with cancer. Dreamtime Dive & Snorkel … a celebration of Australia’s first national people. Experience Co has launched a new ‘Dreamtime Dive & Snorkel’ program, an educational and cultural experience that integrates locations on the Great Barrier Reef with a celebration of Australia’s first national people and their connection to Sea Country. 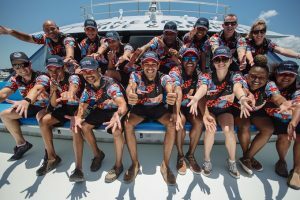 The company’s Indigenous rangers will share their inspiring stories and cultural connections handed down from ancestors who lived on the coastal plains attached to the Great Barrier Reef over tens of thousands of years ago. Stories shared will provide travellers with a deeper cultural understanding of the diverse Sea Country ecosystem, which stretches from Port Douglas to the Frankland Islands. Features of the packages include: Indigenous welcome and acknowledgement, the Great Barrier Reef creation story, visits to two premium outer-reef sites, presentation by a marine biologist, a glass-bottom-boat tour, use of snorkeling equipment, and buffet lunch. The Ghan … an opportunity to experience Australia’s Outback heartland. If you hanker to explore Australia’s Outback heartland and navigate some of the country’s coastline, then Ecruising’s epic 13-night rail-and-sail itinerary next March, ‘The Authentic Australian Expedition’, could be calling you. 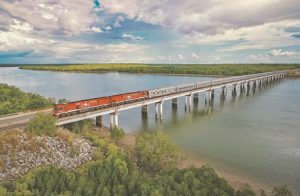 The journey includes three nights in Darwin and one in Adelaide, plus three nights aboard The Ghan and a six-night cruise on board Sun Princess from Adelaide to Sydney. The cruise includes stops at Kangaroo Island, the port city of Burnie, gateway to Tasmania’s rugged north-west; and Victoria’s capital, Melbourne, with its world-class retail offering and celebrated café culture. The package is priced from $5529 per person twin-share, including all accommodation, one-way economy class airfares to Darwin, all meals aboard The Ghan and on board Sun Princess, and transfers. A scenic fixed-wing flight over Uluru and Kata Tjuta is an optional extra. The SeaLink Kangaroo Island Cup Carnival … three days of racing and fun. 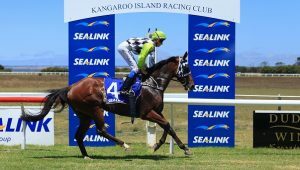 The SeaLink Kangaroo Island Cup Carnival is a three-day celebration of racing, entertainment, food, wine and fun that will run from February 14-16 at the Cygnet River Racecourse. The carnival will feature two race days — the first on February 14 and the main race day, with the Kangaroo Island Cup, on Saturday February 16. SeaLink is offering packages departing from Adelaide, Cape Jervis, Penneshaw and American River for February 16. The full-day race package departing Adelaide includes morning coach pick-up and evening set down at selected Adelaide hotels, return SeaLink ferry, return transfers to the Cygnet River Racetrack and a general admission ticket. It is priced at $189 per adult and $86 per child. For those travelling from Cape Jervis the full-day package is priced at $141 per adult and $62 per child. Upgrade the full-day package for an extra $199 per person and include a four-course menu featuring Kangaroo Island produce, accompanied by local Dudley wines and a selection of beers and soft drink. Cherry blossoms … grip Japan in a fever once a year. Each year in late March to early April, Japan’s cherry-blossom trees, or sakura, come alive in a burst of pale pink and white. And for a fleeting fortnight or so, the entire country is gripped with cherry-blossom fever. Botanica has chartered a boutique ship, the MS Caledonian Sky, to cruise Japan’s coastline during the peak of the cherry blossom season in 2019. 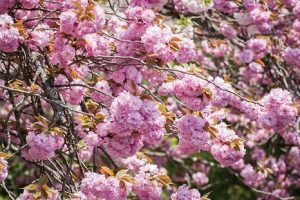 Guests will visit some of Japan’s finest gardens, ancient castles and opulent temples, with plenty of opportunities to view the cherry blossom in their various stages of flower. Participants will also enjoy an included bullet-train journey to Tokyo as well as the added benefits of a cruise holiday, with all meals and drinks included during lunch and dinner. Phone 1300 305 202 or visit www.botanica.travel. Hotel Indigo Phuket Patong … encouraging guests to connect with the vibrant local area. 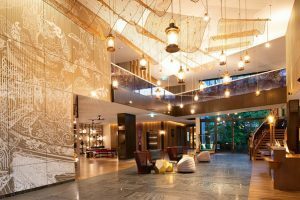 The new Hotel Indigo Phuket Patong has opened and is encouraging guests to connect with the vibrant local area. Located in North Patong and part of the InterContinental group, the hotel is minutes from the famous Patong beach and near shops and entertainment. It boasts a 24-hour fitness centre, pool areas, authentic dining experiences and a casual street-front bar, with sophisticated furniture and local art in each area. There are 180 guest rooms designed to mirror Patong’s vibrant tropical forests, fishing-village heritage and electrifying nightlife. 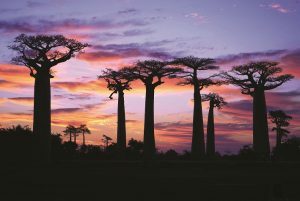 Baobab trees … an integral part of other-worldly Madagascar. World Expeditions has launched a new 15-day ‘Bike and Hike Madagascar’ adventure featuring some of the country’s other-worldly landscapes, and is offering savings of more than $600 per person on 2019 trips booked before this December 31. The price of from $5028 per person twin-share includes 12 nights hotel accommodation, two nights in a permanent safari camp, professional English speaking guide, all meals, day cycles, day walks and a wildlife safari. Also included in bookings made before December 31 is free bike hire valued at $420 per person. One of the glories of St Petersburg … the dome of St Isaacs Cathedral. 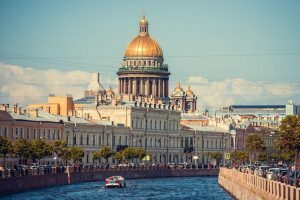 Cruise1st has a 28-night fly/stay/cruise package next year starting with a three-day exploration of St Petersburg, before embarking on a 19-night cruise taking in the British Isles and Northern European Passage before arriving in New York. The itinerary starts with a flight from Sydney to St Petersburg on August 29. The 19-night Regal Princess cruise includes highlights such as Tallinn, Berlin, Oslo, Copenhagen, Kristiansand, Glasgow, Dublin, Cork and Halifax before finishing in New York ahead of a return flight to Australia. The Regal Princess provides sweeping views from the more than 1400 balconies, and from the Seawalk, a glass-floor walkway extending beyond the edge of the ship. The package is priced from $6999 per person twin-share ex Sydney, Melbourne or Brisbane. SeaDream … wines with lunches and dinners, plus an open bar. 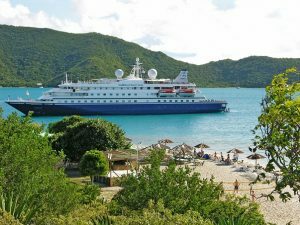 Seadream Yacht Club will follow up its inaugural Cuba season with seven new sailings in early 2020, between Cienfuegos on the south-east coast and the capital Havana in the north-east. The Spaniards built a fortress at Cienfuegos in the 1740s as protection against Caribbean pirates and there remain more buildings from that era than in any other centre in the Caribbean. SeaDream’s 2020 sailings will also have a day in central Cuba’s Trinidad, that the Spanish founded in 1514 and is today dubbed the country’s ‘most captivating outdoor museum’ with its cobblestoned streets, wandering wild donkeys, street musicians, and exceptional beaches. There will also be a day at the unhurried island of Isla de Juventud whose historic caves are lined with Indian paintings, and another at Maria la Gorda that sees few tourists on its quietly remote beaches that are a paradise for scuba divers and snorkelers and home to organised turtle safaris. SeaDream’s seven-day sailings are priced from about $7850 per person twin-share, including wines with lunches and dinners, open bar, a shore excursion in each port of call, power and sail water sports, mountain bikes for shore expeditions, a free onboard golf simulator and fitness centre, and port charges and taxes.